I recently had the opportunity to catch up with an old colleague. We began our careers teaching and coaching together and had some really great years teaching in the same pod of our building. I don't get to see that colleague much anymore due to the distance between us. When we do get the opportunity to see each other, we make the most of it with some great conversation. During our last chat, we had an interesting conversation. It was all about the new high school that his school district is constructing. The current high school that he teaches in is old, dingy and ready to be replaced. Luckily, their school bond passed approving construction of a brand new multi-million dollar facility. I asked my old friend if he was looking forward to the move. He has taught in the same classroom for the last 10+ years and I was curious as to how much of a hassle it was going to be to pack and move all of the materials that he had accumulated. His answer really made me think. A lot. He told me that he was looking forward to getting into his new classroom this summer to get it ready for the new school year next August. I get that. What teacher doesn't get a little excited to set up their room for the upcoming school year? But what he said next, was the kicker. He told me that he was getting rid of everything in his classroom. EVERYTHING. Everything from what he had in his filing cabinets to what he placed on the walls. He told me that he was excited to start fresh. He told me that it is invigorating to think that seventeen years into his career he is starting over. Starting fresh. He relishes the opportunity to create new units and lessons for the classes he has taught for several years. He said he felt like he did that first summer right out of college when he was prepping for his first ever teaching position. While driving home after our conversation, my mind began to comprehend this whole situation. Here is a veteran teacher that was excited, if not ecstatic, about starting fresh for his eighteenth year in education. 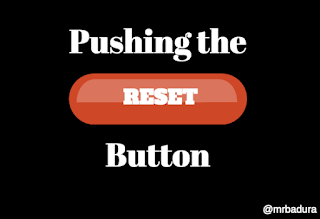 I likened it to pushing the reset button on a video game. 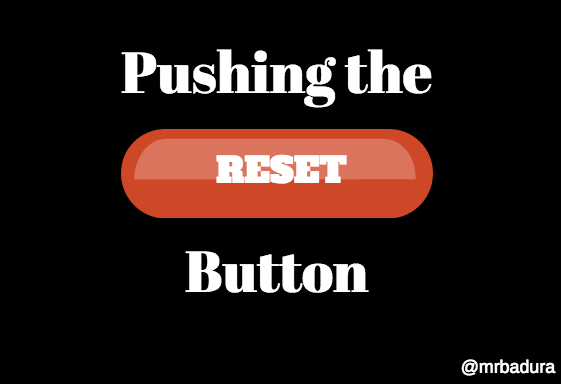 Would you be willing to "push the reset button" in your classroom for next year?